Here is another great freebie from Smith’s you won’t want to miss. Today Only, sign into your Ralphs Plus Card account and get the Free Friday Download for RECEIVE ONE FREE Trolli Extreme Sour Bites 4oz or Trolli Sour Watermelon Sharks 4.25oz. Limit 1 per household. New Coupons – 20% Off Fresh Cucumbers & More! Save 20% on any single purchase of loose Cucumbers at participating retailers. Here are the upcoming offers on Checkout 51. These offers are valid from 12:00 AM on Thursday, February 20 and expire at 11:59 PM on Wednesday, February 26, 2014. Offers must be submitted with receipts dating between the valid times. Here is another great freebie from Ralph’s you won’t want to miss. Today Only, sign into your Ralph’s (Kroger) Plus Card account and get the Free Friday Download for (1) FREE package of Friskies® Party Mix OR Indoor Adventures Cat Treats, 2.1 oz. You can currently get an in-store coupon valid for $10 off your next $10 purchase atToysRUs or BabiesRUs whenever you text GO to 78697 on your mobile phone (see exclusions below). After receiving a reply, just text TEN and you’ll receive your mobile coupon – valid through tomorrow 10/16! I am still waiting on my coupon and it’s been about an hour. Let us know when you receive yours! *Offer available in store only. To redeem from your phone, display mobile coupon at checkout. Excludes diapers, formula, Apple products, Isis products & classes, Buyer Protection Plan, gift cards, phone orders, Special Orders, assembly fee, breast-pump rental fee, delivery fee, and shipping & handling. One coupon per guest. Not valid with any other “R”Us total transaction offer or on prior purchases. Target released some new Mobile Store Coupons! *If the price at your local Target is higher, you can also use this Target Cartwheel Savings Offer – valid for 5% off Market Pantry sandwich bread! 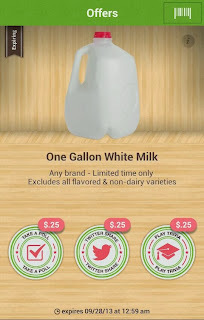 Save $0.75 off MILK With ibotta!!! WOW! Have you checked your ibotta app lately? There is a rare Milk offer available through 9/28/13. Earn up to $0.75 when you buy One Gallon White Milk Any brand – Excludes all flavored & non-dairy varieties. New to ibotta? Sign up HERE and start earning money for your everyday purchases. If you are not familiar with Ibotta, it is a free app available for your iPhone, iPod, iPad, or compatible Android Device that gives you cash back for buying products at the store and scanning your receipt. Locally it works at Walmart, Walgreens, CVS, Target, Sams, Family Dollar, 7-Eleven, and Dollar General, WinCo, and Vons. 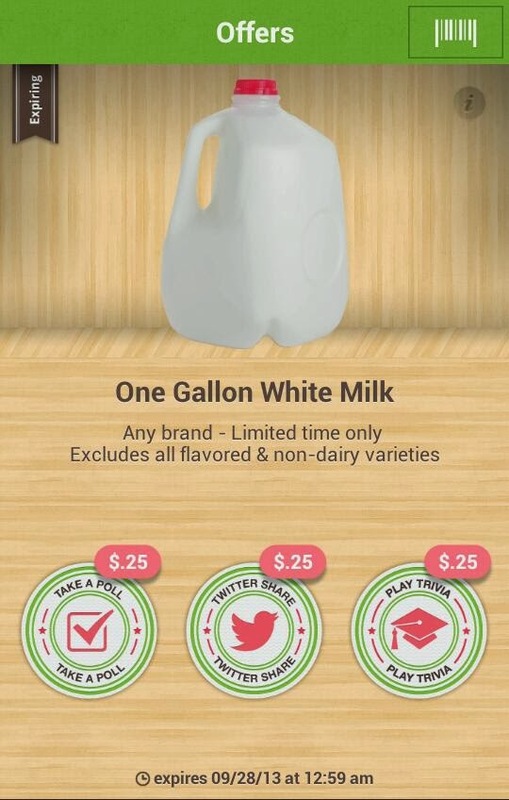 Ibotta App Now Works at Costco + Exclusive Offers! If you are a Costco member and you’re an Ibotta App user, you may be excited to know that starting today you can now use Ibotta offers at Costco!